You can use a rotated drives scheme for storing backups. To do this, you can create backups on several external drives (for example, USB or FireWire) and swap these drives when needed. The drive on which you plan to store a backup must be registered in Veeam Agent for Microsoft Windows. If the drive is not registered, Veeam Agent for Microsoft Windows will not be able to detect the drive and store a backup on it. 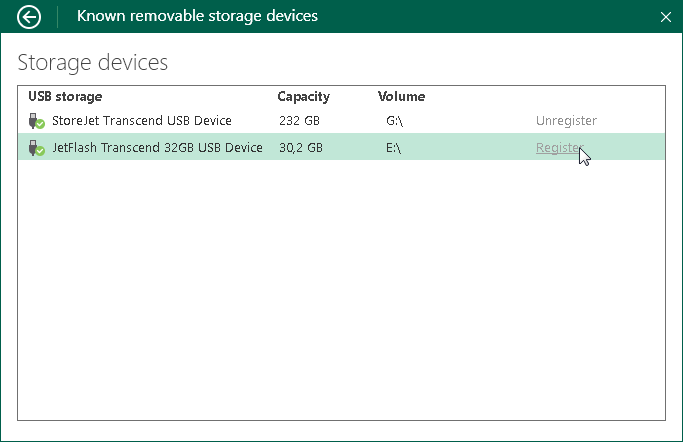 You can register and unregister drives if you have selected to store backups on an external drive connected to the computer. If you have selected to store backups on a local computer drive, in a network shared folder or on a backup repository, registering options will be disabled. You cannot unregister all drives at once. At least one drive will remain registered in Veeam Agent for Microsoft Windows. Click the Manage registered storage devices link. In the list of devices, click Register/Unregister next to the necessary backup storage device.